The family ski village of Saint Lary Soulan is situated in the Aure valley of the central French Pyrénées. The village has long been a popular four-season destination for English, French and Spanish visitors. St Lary's skiing is spread across three sectors totalling 100km (63 miles) of runs over 700 hectares with and an altitude range of 1700 to 2515m. Nearly 200 snow cannon cover large areas of the lopes with machine made snow when required. You can get to the slopes directly from Saint-Lary Soulan village in either the cable car or the ski lift. If you are a non-skier, or need to hire ski's once up on the mountain, it is best to take the cable car, but if you want to reach the slopes and ski strait away, the ski lift if best for you. 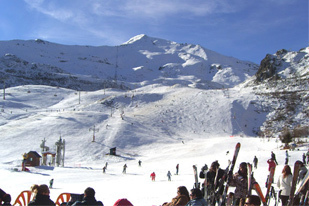 Saint-Lary is a dynamic winter sports destination and the skiing is tremendous. 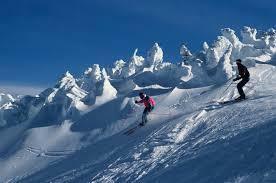 The domain has been excellently planned to suit the needs of skiers of different abilities. (This was a key issue in our decision to set up a skiing holiday base here). It spreads over a total area of 700ha. It is divided into three distinct areas, Saint-Lary 1700, 1900 and 2400. These areas interconnect and are linked by a variety of ski lifts. Navigation from one to the other is easy. Usual opening - Early Dec.
Usual closing - Late March. Saint Lary 1700 Pla d'Adet at the base of the slopes is dedicated to family and beginner skiing with the Snow Garden, toboggan run and Kidpark, a fun snow sports park for budding skiers aged six to twelve years old. At Saint Lary 1900 Espiaube there is a greater emphasis with longer and tougher runs. These include the famous Mirabelle piste, at 3.6 km (2.25 miles), it's one of the longest runs in the Pyrenees with a vertical drop of 700 metres. The highest skiing is at Saint Lary 2400 where there's mogul and slalom stadiums, a snowpark complete with PA system and a halfpipe. Moguls, Slalom, Snow Park, Free ride area and tree skiing. Huge variety of red and blue pistes for intermediates to cruise and enjoy lunch in a choice of great restaurants and cafes. The Chalet de l’Oule, by the side of the lake will provide you with an unforgettable backdrop of the Neouvielle Nature reserve. Sledging track for the little ones and a weekly snowman competition. La Mirabelle at 3.6 km and a vertical drop of over 700 metres - one of the longest ski runs in the Pyrenees. The Glacier Lift which carries 800 people an hour finishes at a final altitude of 2515 metres. A ‘jardin de neige’ and a piste de luge as well as the aptly named ‘Kidpark’. This area is directly linked with the cable car from the village. There are 31 ski lifts.